The other day I was in a Hallmark store buying Halloween cards, and it struck me that this brand is a great example of one that really understands and supports a mom’s need for community. Moms, or all women for that matter, are part of multiple communities, from family and the workplace, to children’s and social groups, to online groups. In order to develop a meaningful relationship with these women, it’s important that brands show support for these communities. One way to do that is to identify a touch point that has emotional relevance to Mom (and her peers) and present it in a way that also provides a sense of validation on her part. A recent study indicates that 90 percent of women agree that greeting cards can lift their spirits and lighten a heavy burden. Hallmark acknowledges that not all moms are living the perfect lives so often depicted in the media, and has made it easier to find cards that offer words of encouragement or support with its Encouragement Cards line. This line of cards, addressing a variety of life situations including job loss, cancer treatment, stress, self-improvement, divorce, and caregiving, helps moms support other moms in their communities through challenging life events. In addition, Hallmark introduced the Kids Encouragement line, providing moms with another platform for showing love, support and pride in their children. Hallmark’s ongoing innovation shows a keen understanding of how to create an emotional bond with its primary customers, and how even the simple effort of sending a card can create a lasting impression and emotional bond between sender and receiver. 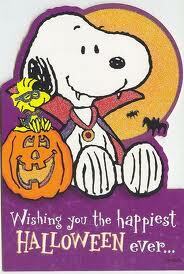 So, since I “care enough to send the very best,” I’m giving a shout out to Hallmark. Here we go again. Bic is taking quite a hit for its “Bic Cristal For Her” pens. Shocking that a company of this magnitude doesn’t understand how to market to women. With women influencing 85% of all consumer purchase decisions, why is it that marketers won’t take the time to truly understand this important audience, and put the time into building authentic relationships with them? Bic Boss: Jenkins, get in here! Bic Boss: I’m thinking we need to go after the female market. Bic Boss: Women consumers, man! Women do most of the buying in this country so we need pens just for women. Jenkins: What’s wrong with our regular pens? Bic Boss: Aren’t you listening? Women want womanly things — pink and purple and flowery and… I don’t know… what are you doing? Jenkins: Just writing this all down — pink, purple, flowery. Ooooh, diamonds. Women like diamonds. Bic Boss: That’s good. Work diamonds in there somehow. Only not real diamonds. Just make them diamondy. Jenkins: Diamondy, right. Anything else? Bic Boss: Let me think. What does my wife like? Hmmm, cleaning. She loves to clean. No, that doesn’t help. Uh, she’s reading some book about gray shades. Make sure one of the pens writes in gray. Jenkins: Shade of gray, got it. Should the other pens write in pink? Bic Boss: Good grief no. We don’t want to be condescending. 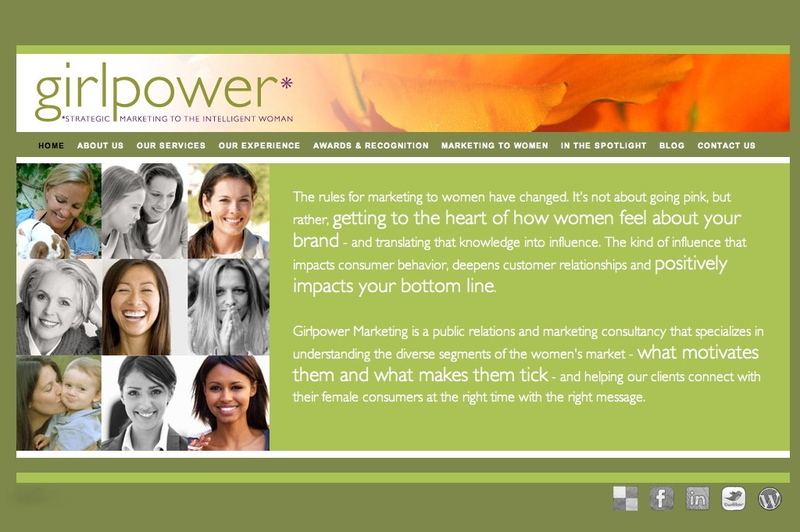 Reaching women more effectively can require some extra effort by marketers – but in the long run it is so worth it. I was really pleased to see the following article by Ekaterina Walter for MediaPost. It’s rare to find such a great compilation of stats (including some from Girlpower Marketing) that drive home the purchasing power of women. Thanks for including us! Women are earning, spending, and influencing spending at a greater rate than ever before — and they account for $7 trillion in consumer and business spending in the United States, and over the next decade they will control two-thirds of consumer wealth. Women make or influence 85 percent of all purchasing decisions, and purchase over 50 percent of traditional male products, including automobiles, home improvement products and consumer electronics. But 91% of women say that advertisers don’t understand them. Recognizing the power and influence of women must be a top priority for marketers if they are going to tap into the market’s full potential. Here are 30 surprising stats to help marketers get a handle on this misunderstood demographic. 3. Women account for over 50% of all stock ownership in the U.S.
4. Women control more than 60% of all personal wealth in the U.S. The sources for the statistics cited in this article are as follows: She-Economy, Ms Smith Marketing, StartUpNation, Clickz, Inc.com, Girlpower Marketing, Catalyst, Forbes. We all know the established generations of Mom: the Boomers, Gen X and Gen Y. But are all Moms equal, or do the generations dictate their parenting values and core marketing preferences? My colleague Stacy DeBroff, founder and CEO of MomCentral Consulting, recently conducted a survey to find out how ages and stages impact Moms. The study also revealed that Moms are feeling more isolated than ever before – due primarily to today’s mobile society and their own attempts to achieve “Super Mom” status. This isolation, coupled with the feelings of guilt, has resulted in Moms seeking alternative ways to reach out and connect. Social media has become the conduit between Moms and their trusted connections to other Moms and brands. Much like Moms want relationships with fellow Moms, they also want relationships with the brands they love – and when they feel engaged, they are more likely to make a purchase, or recommend a brand to their friends. What’s Important to Generation Mom? 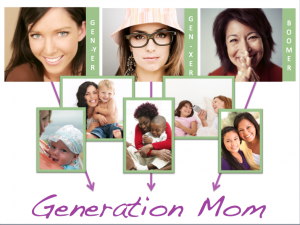 What’s important to Generation Mom? Her family, her passions, her relationships, her children. Generation Mom feels a deep need to connect with the world around her – and social media has become the way in which that happens. Twitter and Facebook now mimic the neighborhood friends of previous decades. They help women expand beyond their immediate worlds and make new friends, while reconnecting with old friends. The Internet also provides Moms with access to ready-made communities that provide support for those who knit, do yoga, need help with potty training, or other issues. As social media becomes the new “picket fence” for Mom conversations, the age of those Moms appears to be proving irrelevant. Regardless of age, brands will find her online. There may be some slight media preferences by age – Gen X Moms read more magazine articles than Gen Y Moms for example – but all generations surveyed embrace social media. And whether a Mom is 25, 35 or 45 – shared parenting values bring them all together as Generation Mom. When marketing to moms, is your brand participating in the emergent platforms where Moms are congregating online? Does your messaging map to a Mom’s core values? Recently Maria Bailey created a list of places a brand needs to be in order to engage with moms. Her list was right on the money, so I thought I’d share it here. 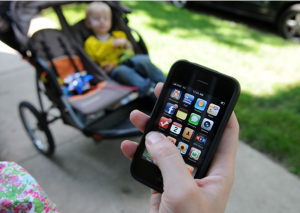 We all know moms are constantly on the go, and use numerous technology tools to stay connected. Mobile apps, iPads and Smartphones are just some of the tools that help brands market to moms and engage them at the right time and with the right message. Here are some additional tools that should be part of any marketers toolkit when reaching out to the mom market. As the second largest search engine, YouTube provides moms an easy way to not only search for products, but to also learn how to use them. Create short videos — less than three minutes — that tell moms how to create solutions with your product. Use mom vloggers or mom employees to produce videos in order to create a relevant connection with the female audience. If you haven’t discovered this hot, new social media community yet, make it a New Year’s resolution to do so. This is not only where moms are migrating for ideas and product suggestions, but it’s cool to her tween and teenage kids as well. The next time a mom blogger tells you she loves your product, ask her to “pin” it on her Pinterest bulletin board. An article by the Associated Press,“Why Are Toys Selling Out? Might be Mommy Blog Buzz,” focused on the success of LeapPad Explorers and their popularity, thanks to the buzz created by MommyParties. It’s using the fun of in-home Tupperware parties without the pressure to buy items. Allowing moms to test and share your product in a social setting is an effective way to fully engage mothers in peer marketing. We often forget the power of email; however, moms are still reading emails several times a day. In fact, most say they learn about sales and promotions via email. They also say they don’t want numerous emails promoting the same deal or emails that have no relevance to their lives. In other words, don’t send a mother with teenagers an email promoting baby food. An “unsubscribe” is sure to happen, followed by a delete of your company from her buy list. Brands love to sponsor conferences but often do so without a plan or strategy behind it. Sometimes bigger is not better. There are over 30 mom blogger and social media conferences in 2012. Some of the smaller, more intimate conferences can provide you a better platform to truly engage with the moms in attendance. It’s not about being a logo on a brochure, but rather truly engaging with those who are at the conference. There are conferences for Christian Moms, Frugal Moms, Video Moms and many others. Look for the conference that fits your brand and message. “There’s an app for that” and moms on average have 31 of them on their iPads. One-third of them is there at the request of her children. Make sure you are among the solution-oriented apps that she downloads to her wireless device in 2012. More and more moms are listening to podcasts. It’s easy and inexpensive to create a podcast for your brand. Consider what solutions you can offer mom and pull up a microphone. For example, if you are a car company, create product podcasts on travel ideas or destinations for families. If you are a food brand, consider a cooking podcast. If you can’t find a radio guru in your hallways, think about contracting with a mom podcaster to host your show for you. Utilizing the tools above will help brands build those engaging, ongoing relationships that are so critical in the mom market. Today’s women are not looking for a watered-down version of a male offering that has been feminized with clichéd colors. Instead, they’re looking for solid information, ease of use, stellar customer service, and brands that are looking to build real relationships with them based on their interests, personal identities and problems that they need to solve. 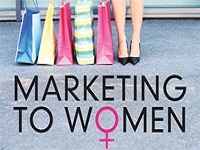 Instead of relying on outdated assumptions and stereotypes, marketers must do the hard work to be relevant to women consumers – taking the time to learn what motivates them to order to present their brands in a meaningful way. A woman’s b.s. meter is always on – she knows when she’s being addressed in an authentic way…and when she’s not. All human brains start as female brains, until the male brain is flooded with testosterone. But there they part paths. A woman’s brain has four times as many connections between the left and right hemispheres as a man’s. All of those signals hurtle down the superhighway into her right brain – the home of emotional memory, intuition and experience. A woman not only reads – she attaches feelings to what she’s reading. A woman’s heart is in her brain – tell her a story that is filled with emotion, and explain why your brand is relevant to her. Sounds simple, but many businesses develop and market products without ever asking their female customers what is most important to them and why. Companies such as Best Buy and Volvo have made gaining women’s input a key part of their marketing process, leading to product improvements that both men and women appreciate, along with marketing messages that resonate with both. A woman’s half-truth can cost marketers billions of wasted dollars not just in concept development and market research, but in the marketplace where it really hurts. Marketers need to take the time to really understand the women they’re talking to – what motivates them and what makes them tick. In preparing for this year’s M2Moms –The Marketing to Moms Conference, I’ve touched based with a number of the speakers to find out what’s on their minds. I’ve been struck by how much of today’s best practices for marketing to the current batch of Millennial moms can be directly applied to marketing to their Boomer mothers. Stacy DeBroff founded Mom Central, a consulting firm and online resource for moms and mommy bloggers. Her recent research has shown her that “Moms have become untethered in their brand loyalties, partly as a result of the Recession and partly as a result of the social media culture. Moms are willing to leave brands. I’ve written before about the willingness of Boomers to leave brands as well. Old stereotypes assumed that brand loyalty, once gained, was never lost as consumers grew older. If that stereotype was true in the past, it isn’t any longer, for Moms or for Boomers. As women find new ways to connect with each other, they also find new brands that meet their ever-changing needs. Or, as DeBroff says, “We’re entering the age of relationship marketing and it’s fascinating but for many brands a real struggle.” The brands that win this struggle are the ones that deliver useful resources online and serve the social platforms where women connect. Emily Bader from the Zocalo group is bullish on Mommy bloggers; she says that there will be 4.4 million of them by 2014. And if Bader is bullish on Mommy bloggers, I’m even more bullish on Boomer bloggers. What does the growth of mommy bloggers have to do with Boomers? First, many of these millions of women will keep blogging as they age. So get ready for a giant wave of Boomer bloggers who keep influencing other women after they turn 50. Second, Boomer bloggers deliver the same benefits for marketers as younger Moms. They generate meaningful conversations and they share actionable recommendations around issues meaningful to other women like them. That’s what brands need, whether the blogs reaches women aged 25 or 55. Bader says there’s no limit to the number of meaningful Mommy blogs as long as each one generates meaningful conversations. That leaves a lot of room for Boomers to launch blogs, and marketers to leverage them for results. Miriam Arond runs Hearst’s Good Housekeeping Research Institute and has been studying female consumers/readers for many years. And she sees that Boomer moms have entirely different relationships with their child-bearing daughters than they had with their own mothers. The average CPG brand describes its target consumer as a “Mom.” But reaching that young mom is different than it used to be. And increasingly, it looks a lot like marketing to her own midlife mother. I was in a new business meeting the other day where I was discussing the immense marketing muscle of women with a brand manager. This brand manager (a man) chimed in that he didn’t necessarily buy it — he wasn’t so sure that women had the buying power that they actually do. Which might explain why his brand (as great as it is) is languishing. I walked out of the meeting more than a bit frustrated at his assumption that his point of view was the right one. Especially since it was so wrong. When I got back to my office, my website home page (my screen saver) was staring at me. And so I read it. The facts about the power of women as consumers are indisputable. Their collective buying power exceeds the economy of Japan. They control more than 60 percent of the personal wealth in the U.S., and account for 68 percent of all total online spending. According to Tom Peters, one of the world’s top marketing gurus, women are the top marketing opportunity for the foreseeable future. And it’s a scientific truth that women and men see and interpret things differently – because their brains work differently. But the reality is that if a product or brand meets the needs of the women, it also exceeds the need of men. Smart marketers understand this, and are willing to look at new ways to translate their brand’s marketing messages to reach this key consumer. So here’s the skinny: women DO make 85% of all consumer purchasing decisions. 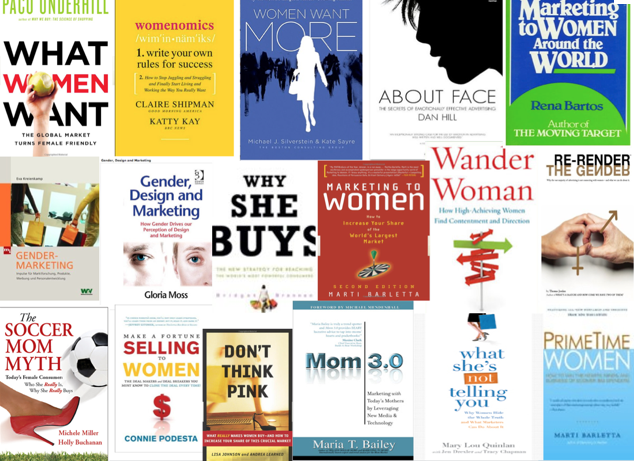 Women DO feel that marketers don’t understand them. Women DO account for $7 trillion in consumer and business spending, which is a lot of buying power. The savvy marketer (and successful brand manager) knows this. According to a recent report by Mobio Identify Systems, Inc., the use of QR (“Quick Response”) codes has exploded by 1,200 percent during the last half of 2010. Moms are taking center stage as they use their smartphones to click on those unique black and white squares that are delivering a wide variety of information to consumers. Blogs, tweets, magazine articles and broadcast media are all talking about this latest technology that busy moms are embracing. QR codes have been around awhile in other parts of the world, but are just beginning to really gain awareness in the U.S. 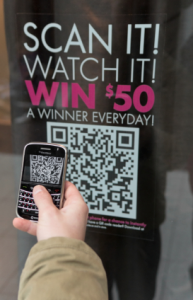 The primary benefit for marketers is that the QR codes are helping them build their mobile strategies. With 60 percent of moms owning smartphones, developing a strong mobile strategy is a must for marketers who want to reach moms in a way that is effective and relevant for their busy lifestyles. For female consumers, the primary benefit of QC codes is their convenience. And that’s what it’s all about when marketing to moms – helping to make their lives easier. A QR code can be snapped on a smartphone camera, and instantly deliver detailed information about a product, consumer reviews, e-coupons, comparison pricing, and much more. Codes can be printed on everything from promotional materials to billboards and point-of-purchase displays. They can even be used to encourage consumers to “like” a Facebook page, deliver digital prizes, or enter sweepstakes. A few major brands are helping to build prominence for QR codes in the U.S., including Target, Best Buy, Macy’s and Post Cereals. Best Buy has enhanced the shopping experience of its customers by adding QR codes to all their price tags. According to a recent Ad Age article, Macy’s is behind the most visible QR education effort, with a 30-second spot running nationally. The spot explains to shoppers how to use the codes, and the benefits they’ll experience once they scan one with their smart phone. The opportunities for incorporating QC codes into marketing campaigns are endless. A QR code on a bag of pasta can be scanned to receive an instant recipe on a smartphone. A coffee retailer can offer free coffee to every 10th person by scanning the bar code at checkout. And at checkout customers can scan their QR codes to see if they’ve instantly won any additional value. As QR codes continue to be highlighted in the months to come, the important thing for marketers to understand is how to make QR codes effective to female consumers. In addition to convenience, a primary way to make codes effective is to make sure they equate to value – a discount, a coupon, or a “sneak peak” at upcoming products. Is this the year of the QR code for your brand? Anyone who reads my blog on a regular basis knows that moms are the most coveted consumers in the U.S. market. Their buying power tops $2.4 trillion annually, and they control or influence 85 percent of all household purchases. Maria Bailey has written a new book called Power Moms that delves into that power of moms. 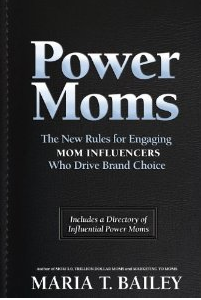 In her book, Bailey acknowledges that mom bloggers are powerful influencers. However, she notes that these bloggers are only a small fraction of the 83 million mothers in the U.S. Which means that marketers reaching out to mom bloggers are leaving a lot of moms untouched – about 70 percent of them to be exact. Power Moms (those influencers that align with a brand’s goals and marketing needs) can be reached by marketers both online and offline. Moms tend to build their sphere of influence around a personal passion – whether it be cooking, entrepreneurship or service to others. The challenge for marketers is to identify that group of moms that aligns with their particular brand’s goals and needs, and then to have the knowledge, awareness and ability to tap this powerful and lucrative market. Marketers: Does your brand reach moms in a way that is relevant to them? And moms: Do you find that most brands engage with you in a way that makes you feel understood?